A fast and fun 3v3 MOBA based 2D platformer, Awesomenauts allows players to battle it out online or through local split-screen for offline play. With multiple colourful cartoon characters to choose from, that are fully customizable, the game provides a wealth of tactics to matches and adrenaline pumping action. 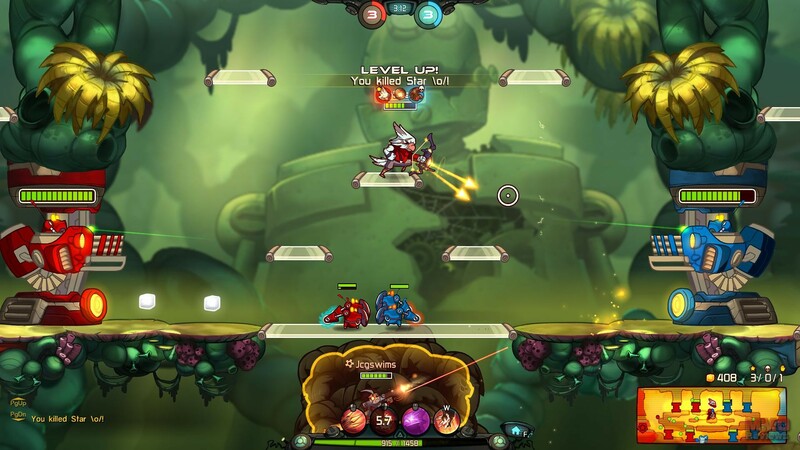 At its core Awesomenauts is a traditional MOBA played out in 3 v 3 matches. Players must face each other using the assembled Awesomenaut characters they have unlocked, each with their own unique skills. The game focuses on fast gameplay and WASD controls to move around the 2D environment between levels. Using the mouse to aim attacks players must react quickly to out think and outmanoeuvre their enemies. During a battle players collect solar cubes from around the map or from kills that allow them to purchase items in the shop. As kills are made the teams earn group XP levelling up and gaining more health and damage output. Completely free to play the game provides a handful of characters to play for free, which rotate each week. Players earn characters by acquiring game currency through playing or by spending cash as micro transactions. When dropping into the battle players will pilot to the planet in their own drop pod. This pod can be steered left and players can try and gather some initial solar cubes. These cubes can be spent in the shop, giving players a head start before battle. Divided into two teams the red team start on the left of the map, and the blue team on the right in their bases. Within each team’s base stands a Solar Drill; destroy the opponent’s drill and the game is won. Both teams have the same objectives so both teams must attack the enemy defences and protect their own. Along with their team players also have the aid of AI controlled minion waves. These clever characters continue to spawn and push the platform lanes fighting whatever enemies come in their way. Killing off the enemy teams wave allows your own minions to push at the turret defences. Turrets deal high amounts of damage to players, but they priority target minion waves, allowing players to get close enough to attack the turret. Play flows from left to right, with the bases at opposite ends of the battlefield. However, there is a top row of platforms that minions move along, and a lower level, each has turret defences. Players must navigate between the different levels to catch out their opponents and push lanes. In certain areas players can find cover areas such as bushes to hide them on the map. There are also different AI enemy camps that can be killed for buffs and health. The Awesomenauts come in a variety of roles, each providing a different play style and purpose in a team. The Tank soaks up damage and protects his allies. The Assassin deals high amounts of single target damage. The fighter is more durable and can deal decent damage. The Support heals and aids allies in various ways. The Harasser is super mobile ranged DPS that deals damage from a distance.